With the recent development of new cases, the forensic unit will be moving to have his bail conditions revoked and ask the State to remand him into police custody with immediate effect. Last year Naicker was remanded into custody for a period of three weeks at the Boksburg Prison where he appeared for cases opened against him. He was then transferred to Pietermaritzburg, KwaZulu-Natal for a series of cases for similar counts of fraud where he appeared and was granted bail. Naicker uses social media, Gumtree, OLX and gay dating and hookup sites and apps to lure his victims into his schemes. He has recreated his social media profile and attempting to change his physical appearance in order to continue with this criminal activity. At current the following cases are open and pending at the following SA Police stations against Sugan Deon Naicker. Please contact IRS should you have opened a case that can be added to the list. 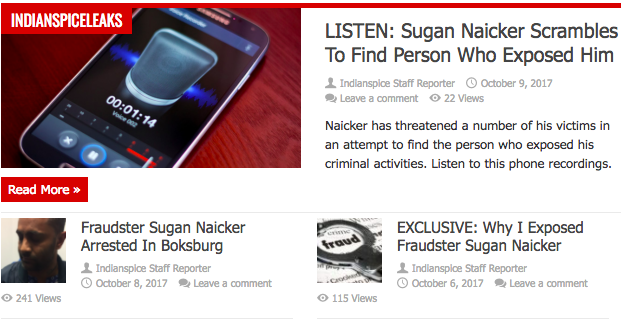 As a matter of public interest readers are urged to share this article in efforts to prevent Naicker from duping more victims out of their hard earned savings. Indian Spice’s KALI unit has started to receive new cases from victims who outlined his signature act of being able to promise them vehicles at cheap cost if they deposited money into his private accounts. Another offer he is purporting is that he is in the jewelry industry offering deals below cost. Another victim took to social media to share her experience with the fraudster. 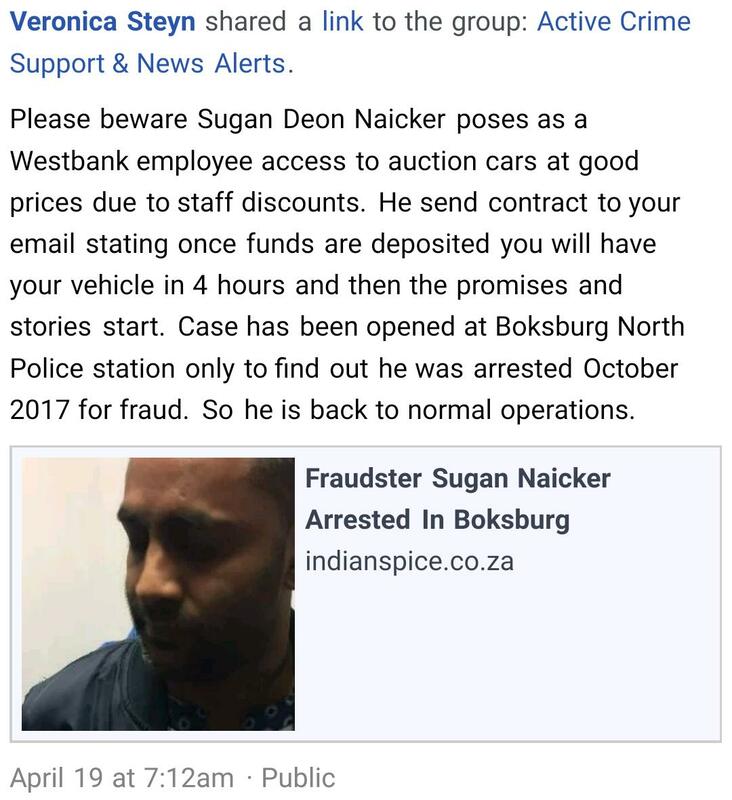 Have you fallen for Sugan Naicker’s scam? Here’s how you can recover your money. The Boksburg SAPS and the IRS Forensic Investigations agency are working with victims adding on to the other charges that are filed against him. IRS Forensic Investigations specialises in financial crimes has been keeping tabs on Naicker, his movements and also assisting victims to recover their money from the fraudster.